Unbeaten and defending champions Grenada advanced to the BVI Cricket Association LIME Twenty 20 League Premier Division final, after beating Royal Knights by four wickets in Greenland on Sunday. Chasing Royal Knight’s 189 for victory, Grenada was in total command of the game cruising at 140, when Rodney Marryshow fell, caught and bowled by Murray Ollivere for 46 to cut their momentum. This was followed by Raymond Charles going for a duck, during a spell where they lost 4 wickets for 49 runs, to revive Royal Knight’s slim hopes of advancing to the final. Then Orville Lewis stepped in and closed the door with two boundaries and the last of three towering sixes to win the game as they made 189 in 16.3 overs. RTW advanced to the Division I final after beating Virgin Gorda by six wickets. 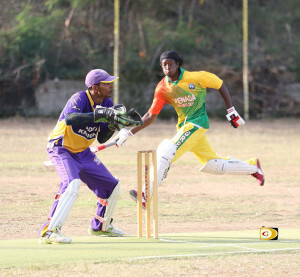 Virgin Gorda were bowled out for 147, while RTW in their turn on the crease were 150 for 4 in 13.3 overs. RTW will face the Under The Tree vs Island Stars winner.